To help get the word out for Burn the Ashes, I’m hoping my readers will post honest reviews on Amazon and Goodreads. In exchange, when there are 5 reviews posted, I will release a chapter from the sequel here on Ember Writes! 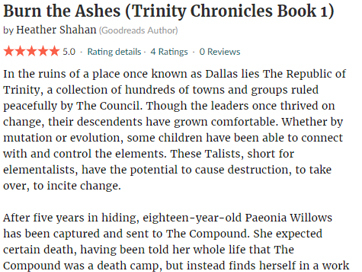 So far there is 1 review posted on Amazon, though multiple have rated Burn the Ashes as 5 stars on Goodreads. A wonderfully crafted and dark novel. Wasn’t sure what to expect going into this book, but was pleasantly surprised by it’s ability to draw me into it’s world. 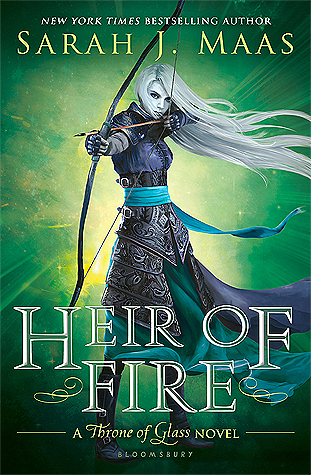 Heather has a gift for investing you in her characters and story-line with little effort. The tone was much darker than I had anticipated, but did it’s job with flying colors. I found myself trying to find as much time as possible to read this book. I just could not put it down until I was finished, and was left wanting more. -The characters feel real and relate-able. No one feels forced and everyone feels important. While the character names were odd, they weren’t bad. And seeing as it is set some 150 years after a destructive event, we can forgive a few odd names. -The setting is one that I find intriguing and fascinating. While “Book 1” is contained to a specific location, I have been told by the author that the following books will explore the post-event world more. -The plot was not overly original, but was done in a beautiful way that made me forget any notions of similarity. The only single thing I have to gripe about with this book is it’s length. It is too good to be this short and with no set date as to when we will see Book 2, I am left in withdraws. P.S. I lied, the only other gripe is that the description of the element “Aqua’s” symbol in the book is a slight variation from how it is depicted on the back cover of the book. This is a small issue that really means nothing.